Set the scenario by telling students they are need of a gas grill. Instead of just running out and buying the first model they see, they must choose a model and compare prices of the same model from 4 different stores. Students will complete the Buying Report assignment found below as they work through the project. After completing the Buying Report for gas grills, discuss that not everyone might live in an area or place where they can have or use a gas grill. So for them, an indoor electric grill might be a better option. 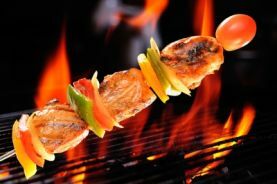 Explain that they can investigate/compare electric grills in the same way, however, they are usually less expensive than a gas grill. I ask students to create a Venn Diagram comparing the two grills (gas vs. electric) as well as create a T-Chart illustrating pros and cons of each. Students then share their findings as a class. Before students prepare the the Chicken Kabob lab, we go over safety, both with the grill and with the food being prepared on the grill. I remind them food safety is just as important in outdoor cooking as it is with indoor cooking! See resources below for websites and videos regarding safety with these appliances. Finally, students will prepare Chicken Kabobs on wooden skewers for their lab. Note: If doing this lab with outdoor gas grills, you make want to check the weather before scheduling this lab, especially if you don’t have overhead roof protection! Also, you may have to line up some additional gas grills depending on your class size. There are always teachers who will volunteer to bring in their grills in exchange for food! If you feed them, they will share!! I like this recipe, because it’s super easy…just remember to soak wooden skewers ahead of time. Note: You can also easily substitute chicken thighs in place of the chicken breast for a juicier, less expensive option. And, if you have block periods, students could certainly experiment with homemade marinades.